Chris Benderev is an associate producer. He helped create the “For The Record” segment for Weekend Edition Sunday and the biweekly sports segment with Mike Pesca. He occasionally directs the program. Chris has done work in NPR’s Programming Department as the producer for the pilot season of podcast Embedded with Kelly McEvers, including co-reporting a documentary-style piece about a closing public high school outside Pittsburgh. Chris has also worked as a producer on the social science podcast Hidden Brain. He tweets @cbndrv. Peter Breslow is a senior producer for NPR. He has reported and produced from around the country and the world — from Mount Everest to the South Pole. During his career he has covered conflicts in nearly a dozen countries, had his microphone splattered with rattlesnake venom and played hockey underwater. For six years he was the supervising senior producer of Weekend Edition Saturday, managing that program’s news coverage. Over the years, Peter has been honored with numerous awards including Overseas Press Club, DuPont-Columbia and two Peabody awards. A native of River Edge, N.J., Peter worships Muddy Waters, is a graduate of the University of Massachusetts and is an Eagle Scout. Olly Dearden is a producer. He began his career scraping a living together as a freelancer before landing a job at the BBC. From working in local newsrooms he moved on to become a network news producer in London. After nearly 10 years with the BBC — and one night shift too many — he left to join NPR as a producer. Following a stint at Morning Edition he found his home at Weekend Edition. And, he is happy to say, he is no longer scraping a living together. Sarah Handel joined Weekend Edition as a producer in 2013, after nearly 10 years spent directing, producing and editing Talk of the Nation. She got her start in radio at WUOG, the student-run radio station at the University of Georgia, then moved to Washington, D.C., to attend Georgetown University and intern at NPR. Some of her favorite interviews to produce are with musicians, such as Xenia Rubinos, Myrkur and Mr. Lif. It’s no wonder, really — yes, she is related to that other Handel. She tweets @sarahhandel. Barrie Hardymon began her career studying viola at Juilliard. She has since worked as a cocktail waitress, a shopgirl in a string of high-end lingerie boutiques and a cashier at New York’s Strand bookstore. At the Strand, she distinguished herself by hollering “Next!” at a decibel level completely out of proportion to her size and by recommending John Fowles’ The French Lieutenant’s Woman — a novel that changed her life — to patrons wandering the Self-Help section. Barrie worked as a producer at NPR’s member station in Baltimore, WYPR, where she developed a love of live radio and a hatred for screening calls. At NPR she has worked as an editor (and call screener!) on Talk of the Nation and Morning Edition and now edits a variety of topics on Weekend Edition, with a focus on books. (She’ll never get tired of hearing Scott Simon call her “our literary editor.”) She’s a reviewer for NPR Books and a frequent panelist on NPR’s Pop Culture Happy Hour podcast. Barrie still thinks you should read The French Lieutenant’s Woman. Jordana Hochman is the show’s senior editor. She has developed news features on the struggles of addiction, crises of religious faith and issues of adoption and identity, among others. Jordana has brought Weekend Edition listeners interviews that range from highbrow to pop culture — from former Supreme Court Justice John Paul Stevens to the Backstreet Boys. She was an editor at Morning Edition for a decade and began her career in 2003 at NPR as an intern on the Washington Desk. Originally from Detroit, Jordana received her B.A. in women’s studies from Vassar College. She completed an M.S. in psychoanalytic theory from University College London. At home, she’s a MacGyver with a CSA box. Ravenna Koenig is a producer and director. Before joining the show she interned at WNYC’s On The Media and Benjamen Walker’s Theory of Everything podcast. Since joining Weekend Edition in 2014, she has produced interviews with a diverse range of guests including Charli XCX, Mark Morris, Brie Larson, Ibeyi and Sandra Cisneros. Her reported work has also been featured on NPR, with a focus on arts and culture. During the 2016 presidential cycle, Ravenna has field-produced stories on the election and was part of a team that produced Morning Edition‘s documentary special about how Americans see President Obama’s time in office. Her hometown is an island near Seattle, and while she doesn’t miss the rain, she does miss the feeling of wonder after 30 straight days of it. She tweets @vennkoenig. Sarah Lucy Oliver is the executive producer. Each week she is responsible for sorting through producer, editor and desk pitches and making sure there’s some joy in every show. Sarah joined Weekend Edition as an intern in 1989 and came back to be veteran journalist Daniel Schorr’s assistant. She has been with Weekend Edition ever since. In her two decades at the show, Sarah has held a variety of roles and produced a broad range of stories, her personal favorites being pieces on the Sept. 11 attacks, Major League Baseball’s Grapefruit League in Florida, the gravesite of Stonewall Jackson’s arm, and interviews with all sorts of luminaries including President Carter, Patti Smith and Mr. Rogers. Stacey Samuel is the supervising editor. She came to NPR from the world of television, most recently CBS News and CNN before that — where she was a part of the Emmy-award winning team for 2012 election coverage. In a previous incarnation in New York City (her hometown) Stacey worked on documentaries at HBO and for some familiar cable channels, including the History Channel. She has been in front of the camera as an award-winning education reporter in Florida and spent some time in online journalism at the Daily Beast. Stacey is based in Washington, D.C., and tweets @staceyssamuel. Ian Stewart is a production assistant. Since he joined in early 2016, he has followed presidential candidates around Iowa and New Hampshire, tracked down “Chewbacca Mom” and worked on the series “How Did We Get Here?” He got here after interning at All Things Considered, studying architecture and politics at Middlebury College and growing up in Iowa City. He really likes yardwork, graphic design and waffle fries. Gemma Watters is an associate producer and director. She remembers when she was 6 asking her mom how she could be one of the people inside the radio. She doesn’t remember the response but, through sheer luck and determination, she found her way inside the machine. Like quite a number of the employees at NPR, Gemma started as an intern and refused to leave. Some of her standout productions include Bill Cosby’s interview with Scott Simon and an interview with a former jihadist recruiter. On a lighter note, Gemma loves to bring fun to the show by producing interviews with actors and musicians such as Tony Bennett, Roberta Flack, Bruno Mars, Katy Perry, Michael Caine and Daniel Radcliffe. Speaking of the actor who played the boy who lived, when Gemma needs to switch off, she drinks butterbeer and immerses herself in the magical world of Harry Potter. Ned Wharton is a senior producer and has been with Weekend Edition since 1989. Ned produces many of the artist features heard on the program, including signature conversations with Baltimore Symphony Music Director Marin Alsop. He has produced news features from the field, including a trip to Egypt for a series on climate change, reports from Louisiana after Hurricane Katrina and reports on the economy and culture of Michigan’s Upper Peninsula. Before NPR, Ned worked as a classical announcer at WNYC in New York, where he created and hosted the music show Mixdown. Beyond radio, Ned has worked as a record producer. His credits include the New York band Songs from a Random House and Singers, Songs & Sessions, a collection of live performances recorded in NPR’s Performance Studio. He tweets @NPRNedWharton. Natalie Winston is an editor. She got her start at NPR on the Washington Desk as an intern during the 2008 election. That experience hooked her on politics and radio. She was the booker for NPR’s 2012 election coverage, booking interviews with newsmakers and campaign surrogates for all live election specials. She is now an editor at Weekend Edition, where she gets to focus on politics and much, much more. Natalie has worked on interviews with accomplished authors, up-and-coming musicians, Michelin-star chefs, four-star generals and world leaders. Throughout the 2016 presidential campaign season she has helped produce NPR’s live primary coverage and nightly specials from the Republican and Democratic conventions. A $7 million, comprehensive census of African elephants has found that the population decreased by nearly a third between 2007 and 2014. 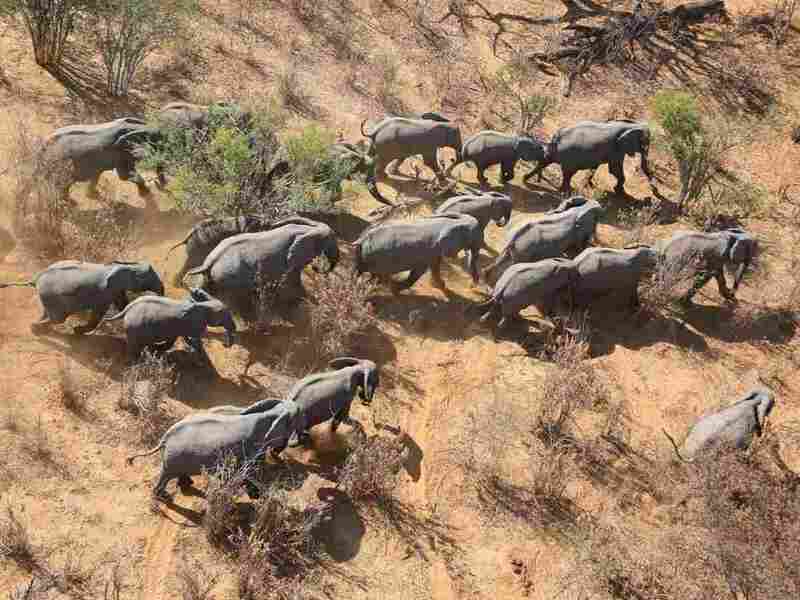 The Great Elephant Census was conducted over three years, and set out to effectively count every savanna elephant in 18 countries in Africa, accounting for 93 percent of the savanna elephants in those countries. The conclusion — that the population declined by 144,000 animals in just seven years — is sobering. The results were published in the journal PeerJ. “If we can’t protect the world’s largest land mammal, the prognosis for wildlife conservation is bleak,” says Mike Chase, the lead scientist on the project and the founder of an elephant conservation group based in Botswana called Elephants Without Borders. The survey took enormous resources to pull off. It was funded in part by an American philanthropist, Paul Allen, and was a collaboration between Elephants Without Borders and government and non-government groups in the 18 countries surveyed. Because individual countries have been responsible for counting their own elephant populations until now, the data from past years was not standardized. Different governments counted animals at different frequencies, using different methods. The Great Elephant Census changed that, providing a standardized baseline of the savanna population across the 18 nations. The team used small aircraft to fly over enormous swaths of land, recording themselves counting and photographing the elephants they saw. Technical advisers meticulously combed through the data to make sure they weren’t counting elephants twice — a concern because the animals move. Past estimates of the elephant population in Africa ranged from around 400,000 to over 630,000, and there was a lot of disagreement about the numbers. The Great Elephant Census estimate, based on the most rigorous survey so far, finds there are just 352,271 elephants in 93 percent of the animals’ range. Much of the decline in the elephant population is due to illegal poaching by people who sell elephant tusks on the Chinese market, as NPR has reported. Past estimates of how many elephants are illegally killed were based on models and incomplete carcass counts, as opposed to comparing population numbers. The new survey finds tens of thousands of elephants are being killed each year. “A key component of this is not only counting live elephants but looking to really develop a master plan for elephant protection across Africa,” says team member Andrew Parker of African Parks, a cross-border park management agency, in a video about the elephant census. Many governments have tried to prevent illegal elephant hunting by establishing parks and disrupting the market for ivory, which drives poachers to go after the animals. Kenya has held public ivory-burning events for years — at the most recent one, in April, the government burned the tusks of nearly 7,000 elephants. “Elephants are already locally extinct in my own country, Mauritania, and I do not want to see this happen anywhere else –-an imminent possibility in Cameroon and Mali, and further down the line in other countries, unless we accelerate action. The findings of the Great Elephant Census will help guide discussions at the next meeting of the international body that regulates trade of threatened animals, the Convention on International Trade in Endangered Species of Wild Fauna and Flora, or CITES. It meets in South Africa in less than a month. 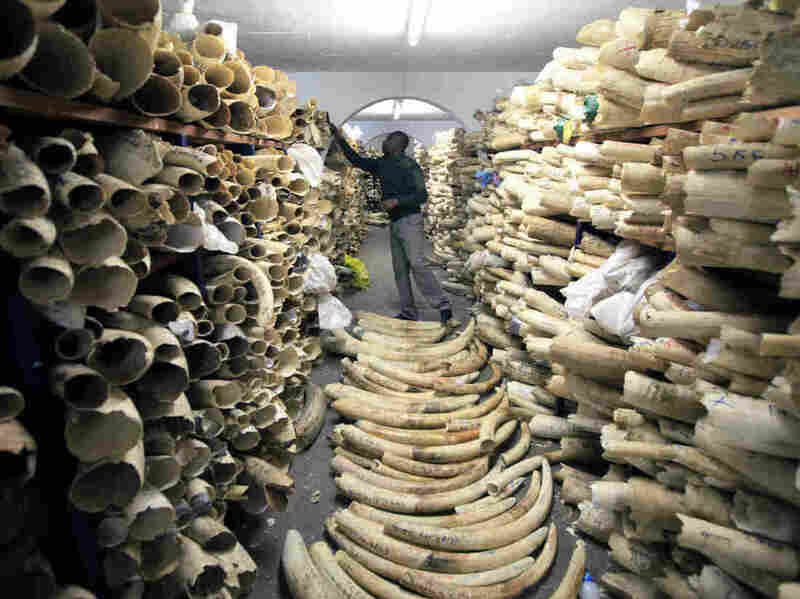 Fighting the market for ivory is on the agenda. Editor’s note: Reporter John Otis first covered Venezuela 19 years ago and has returned many times since. Today, the day before a planned opposition demonstration, he and other foreign journalists were stopped from entering the country. He filed this report while awaiting a flight out. As a foreign correspondent based in Colombia, I’ve made dozens of reporting trips to Venezuela. But today’s has been the shortest by far. As soon as I stepped off the plane at the Caracas airport, immigration officials confiscated my passport, then ordered me to take the next flight back to Bogotá. I’m not alone. Alongside me as we wait to board the plane are Marie-Eve Detoeuf of the French daily Le Monde, and Cesar Moreno, a reporter for Colombia’s Radio Caracol. A few days ago, an Al Jazeera TV crew was turned back at the airport. We had all been trying to get into Venezuela to cover a major demonstration planned for Thursday. 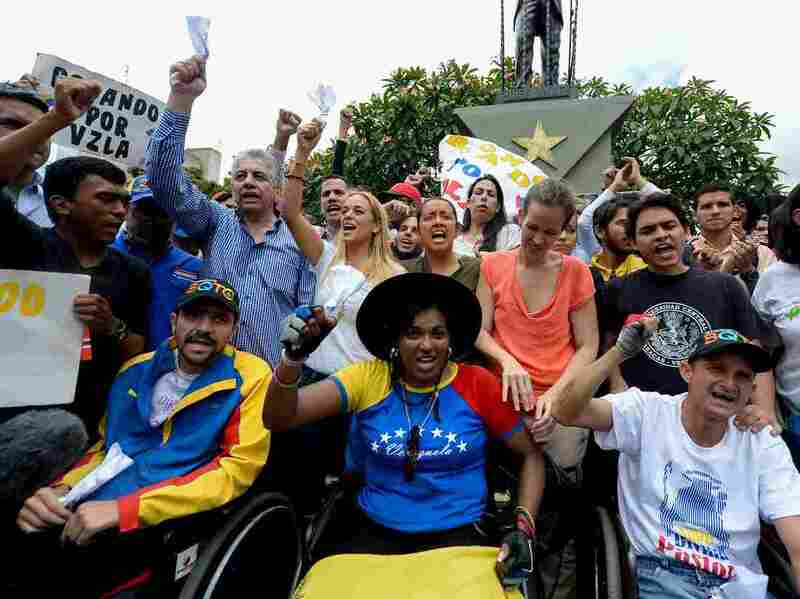 Opposition leaders hope to put a million people in the streets in a show of rejection for the beleaguered socialist government of President Nicolás Maduro, which is dealing with a collapsing economy, the world’s highest inflation rate and a plunging approval rating. But much more is at stake on Thursday — which may help explain the crackdown on foreign reporters. One aim of the march is to pressure authorities to hold a recall election this year. Should Maduro lose, new elections would be held and the opposition would stand a good chance of returning to power for the first time since the late Hugo Chavez ushered in Venezuela’s socialist revolution in 1999. But critics claim the government is stalling for time. The country’s electoral council, which nearly always sides with the executive branch, claims there may not be enough time to gather signatures and organize the voting process to hold the recall this year and that the vote will likely have to be held in 2017. Should that happen, and Maduro loses, his vice president would take over — keeping the ruling socialists in power until at least 2019. Apparently, the government thinks it can control or tamp down news coverage of Thursday’s protest by keeping out foreign reporters. But international news organizations like CNN, AP, Reuters and Bloomberg News all have permanent correspondents here, so it’s not like proceedings will go unnoticed. In recent years, the Chavez and Maduro governments have pressured the news media in Venezuela by passing a restrictive communications law, fining news outlets for coverage that reflects badly on the government and refusing to renew the transmission licenses of critical TV and radio stations. In turning me back today, Venezuela’s immigration officials pointed to norms in which foreign correspondents are supposed to apply for accreditation from the Communications Ministry before arrival. But in many cases, the ministry ignores our requests or we have to deploy on short notice, so we usually go in as tourists. Ironically, while reporters are clamoring to get into Venezuela — the country with the largest oil reserves in the world — few other people seem to have the same urge. This morning, the immigration area of the airport was empty for long stretches of time. Officials had nothing to do but tell jokes and wander off for an early lunch. A divided U.S. Supreme Court refused Wednesday to reinstate a set of voter restrictions enacted by the Republican-controlled legislature in the battleground state of North Carolina. Last month a federal appeals court invalidated the restrictions, declaring that they were deliberately targeted at making it more difficult for African-Americans to vote. The restrictions were enacted in 2013 shortly after the U.S. Supreme Court struck down a key provision of the Voting Right Act. That provision, until then, had required areas with a history of discrimination in voting to pre-clear any changes in voting laws with the Justice Department or the federal courts. 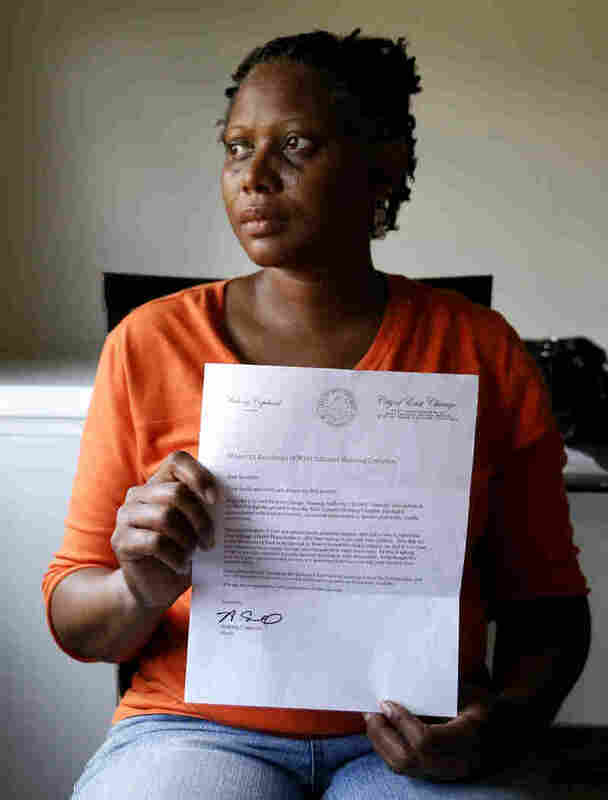 Once freed from that obligation, North Carolina, as well as other states, began enacting laws that minorities claimed were deliberately aimed at making it harder for them to vote. In the Tarheel state the restrictions ranged from strict requirements for photo IDs at the polls, to the partial elimination of early voting, and elimination of same day registration. In July, the Fourth Circuit Court of Appeals threw out those restrictions as intentionally discriminatory. The court noted that the GOP-controlled legislature had drafted the law after receiving data showing that African-Americans would be the most disadvantaged by the new rules. Republican Gov. Pat McCrory then appealed to the Supreme Court, asking the justices to restore the law for the November election. Late Wednesday, the Supreme Court refused to do that, with the justices split, for the most part, 4-to-4, with the Court’s most conservative justices falling one vote shy of the five votes it takes to block a lower court decision. The court has been operating without a full complement of nine justices since the death of Justice Antonin Scalia in February and the refusal of the Republican-controlled U.S. Senate to consider President Obama’s nominee, Merrick Garland, to replace him. You can probably picture a classic telenovela. It’s dramatic, full of scandal. Cheating husbands. Cheating wives. Sunset romance. Dewy-eyed heroines. Perla Farías was a telenovela actress in Venezuela, and she was getting bored of the typical story. So when she became an executive at Telemundo in the United States, she decided to try something different. At the time, Telemundo was the underdog in the world of US telenovelas, always in second place behind the giant Univision. But Farías’s shows changed all that. They altered the landscape of Spanish language TV shows—and of all TV shows. Music: “Sud Flores” and “Latin Drama Queen.” Find us: Twitter/ Facebook. 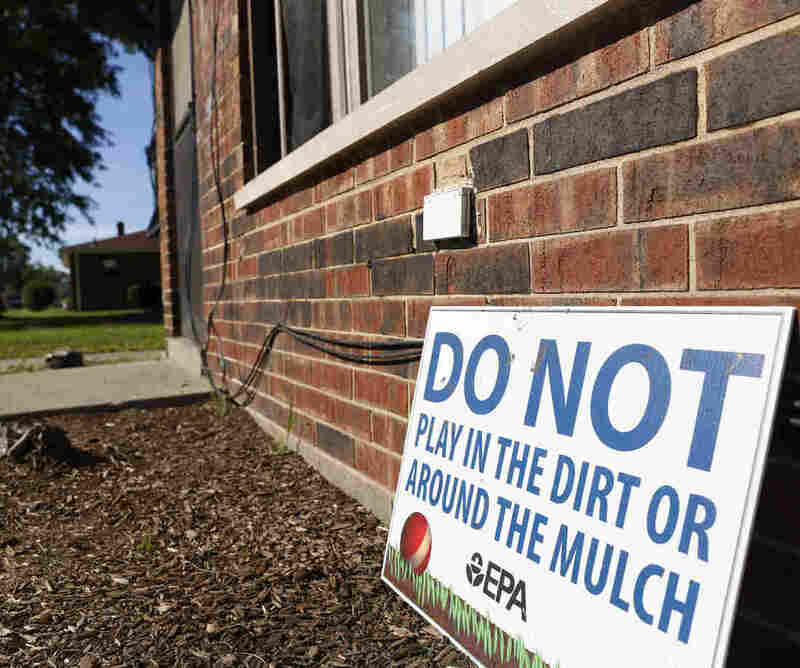 More than a thousand residents of a public housing complex in East Chicago, Ind., are now forced to relocate because of dangerously high lead levels in the area’s soil. After that, East Chicago Mayor Anthony Copeland “ordered the removal of 1,200 residents from the West Calumet housing project for safety concerns,” according to the member station. The residents have now been informed that the 346-unit complex is set to be demolished. Those vouchers will allow residents “to relocate to any public housing complex in the U.S.,” as WBEZ reported. That process will take months to complete, and there’s a lot of confusion about how it will work. Residents told The Northwest Indiana Times that they have received “misleading and confusing information about how much moving assistance is available.” Among the unanswered questions: whether the residents will receive help with costs like “moving transportation and security deposits.” Also unclear: “when the initial security deposits they paid to move to West Calumet will be returned,” according to the newspaper. Today, Here and Now spoke with community volunteer Juan Fernandez, a former resident of the West Calumet Housing Complex, who is distributing kits full of moving supplies such as boxes and tape to the residents scrambling to relocate. He said he lived there from 1995 to 1999, after his father was laid off. He described it as a “tight-knit community” where children regularly played outside. But growing up there, Fernandez said he never saw notices. “If someone knew about that then, I know definitely my dad wouldn’t have allowed his family to move into a contaminated area,” he told the show. The EPA is coming under fire for its response to the lead levels. In a letter to Kaplan dated June 16, 2016 and released through The Northwest Indiana Times, Mayor Copeland said the EPA was slow to respond to early indications of high lead levels and then was slow to release the information to city officials and the public. Lead is especially harmful for children – and “even relatively low levels of exposure can cause serious and in some cases irreversible neurological damage,” according to the World Health Organization. The issue of lead has gained renewed national focus in light of the unfolding lead crisis in Flint, Mich. The London-based singer Dua Lipa has released just five singles, all within the last 12 months. She won’t put out her debut album until February 2017. But the 21-year-old artist has already begun to take shape as a creative force with a sound she calls “dark pop,” melding sparse hip-hop beats with an ear for melody and interpretation. She might be a natural-born pop star: When she’d released just two songs, the BBC picked her for its Sound of 2016 list. But even if pop stardom feels somewhat like a destiny to her — her father is the Kosovar Albanian singer Dukagjin Lipa and she grew up idolizing and imitating pop stars like Toni Braxton and Nelly Furtado — she is just starting to put together the elements that might make it a reality. And despite the fact that she has racked up over 100 million views on YouTube and attracted millions of followers and listeners on social media and Spotify, most of Dua Lipa’s renown comes from her home in Europe. So when she arrived in New York to play her American television debut — on The Tonight Show, no less — the stakes were clear, and the possibilities high. She would have just a few minutes to introduce herself to the biggest pop audience in the world. Noteworthy host Jason King met Dua Lipa in New York the morning before the Tonight Show performance for the latest episode in the NPR Music documentary series. They spoke about how she developed her sound, why she’s always wanted to be a pop star, and why breaking through in the United States is so important to her. 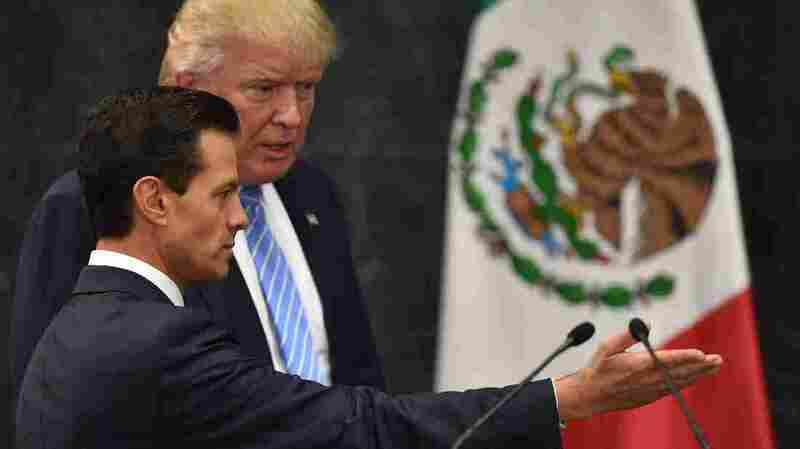 A softer-edged Donald Trump huddled with Mexican President Enrique Peña Nieto in a hastily arranged meeting in Mexico City Wednesday. Both men pledged a commitment to strengthening the U.S.-Mexico relationship. Trump said he had a “very substantive” conversation with Peña Nieto during which he reaffirmed the right of the U.S. to protect it’s borders and build a wall, but that his pledge to make Mexico pay for it didn’t come up. “We didn’t discuss that,” Trump said. Trump was more subdued in his remarks than his usual unscripted, brash style on the campaign trail. He read from prepared remarks in a measured tone. Gone were any of his previous criticisms of Mexican immigrants residing illegally in the U.S.
Trump praised second and third generation Mexican-Americans as “beyond reproach” and said he was proud to employ Mexican workers at his hotels and other properties. “I happen to have a tremendous feeling for Mexican-Americans not only in terms of friendships but in terms of the tremendous people I employ in the United States,” Trump said. “The bond between our two countries is deep and sincere,” he said. For his part, Peña Nieto reiterated the importance of the U.S-Mexico alliance for commerce and national security. And he committed to maintaining that relationship no matter the outcome of November’s election. “The next president of North America will find in Mexico and its government a neighbor that wants to work constructively to strengthen even more the relationship among our nations and to confront together all the challenges that we face together in common,” he said. The two men met and spoke at Los Pinos (The Pines), the Mexican president’s official residence and office. The Trump campaign announced the visit late Tuesday evening — Peña Nieto had earlier extended an invitation to both presidential candidates. Trump is travelling back to the U.S. tonight to give a speech on immigration in Phoenix. Trump’s position on immigration has waffled in recent days. At one point he appeared to back away from his previous support of mass deportations for the undocumented. He has since sought to clarify his immigration stance, and this latest push on immigration is part of that effort. He remains deeply unpopular with Hispanic voters. His visit to Mexico was also widely opposed by the public there. There were some protests in regards to Trump’s visit. Two of Trump’s closest advisers, Sen. Jeff Sessions, R-Ala., and former New York Mayor Rudy Giuliani, joined Trump in Mexico. Meanwhile, back in the battleground state of Pennsylvania, Democratic vice presidential nominee Tim Kaine told voters that Trump has “put his feet in concrete” on his immigration positions, the Associated Press reported. Speaking at a Hispanic community center in Bethlehem, Pa., Kaine said Trump’s words and actions have been “frightening” to Hispanics. Tough headlines can be hard to stomach – and even harder to digest when the stories behind the headlines are nuanced, complex and sometimes difficult to understand. Such is the case with the opioid epidemic, which has spread through America’s homes and consciousness with a devastating impact. It’s affected Americans from all backgrounds and walks of life – from members of marginalized communities to legendary international icon, Prince. So how did we get here and where can we go from here? There are no easy answers. Which is right up Generation Listen‘s alley. 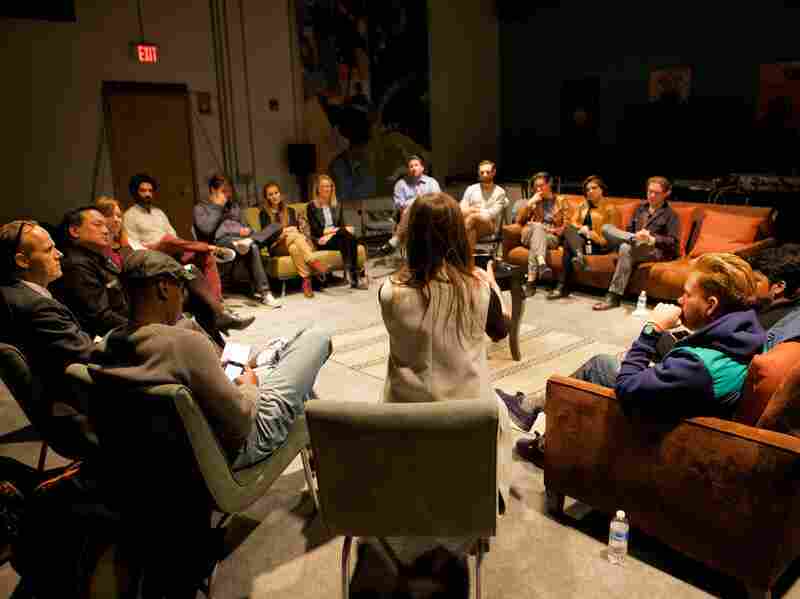 Generation Listen regularly brings together public radio listeners in intimate settings for thoughtful conversations about issues and ideas that matter. Our hope is that together, invested citizens can unpack complicated new stories, cultivate empathy for the lives behind the stories, and start to envision a path forward. How will we tackle the opioid conversation? With NPR’s Kelly McEvers. McEvers, the co-host of All Things Considered and Embedded, has produced powerful reporting about the opioid epidemic, all while lending an empathetic ear to people affected by this crisis. So Generation Listen and Kelly McEvers are teaming up to dig into America’s opioid crisis and explore how we think about addiction. Generation Listen will host two intimate gatherings to listen to McEvers’s powerful reporting from the frontlines of the epidemic. The first will take place in Atlanta on September 1. Then we’ll head to Chicago on September 19. After the listening session, McEvers will kick off a conversation with special guest Maia Szalavitz tackling questions like: How do people become addicted and why? Who is most at risk? What are the most successful ways to treat addiction? The audience will have a chance to share personal reflections, stories, questions and ideas to better understand addiction, its consequences, and the road to recovery. For those across the nation unable to attend, Generation Listen will create a custom Listening Party Kit that empowers listeners to bring together friends, family or colleagues and deepen the conversation in their own living rooms. Look out for the kit in late September and check out past kits here. Generation Listen: America’s Opioid Epidemic is made possible by Cigna, and by a collaboration between NPR and NPR Member stations WABE and GPB, in Atlanta, and WBEZ in Chicago.